The F.E. 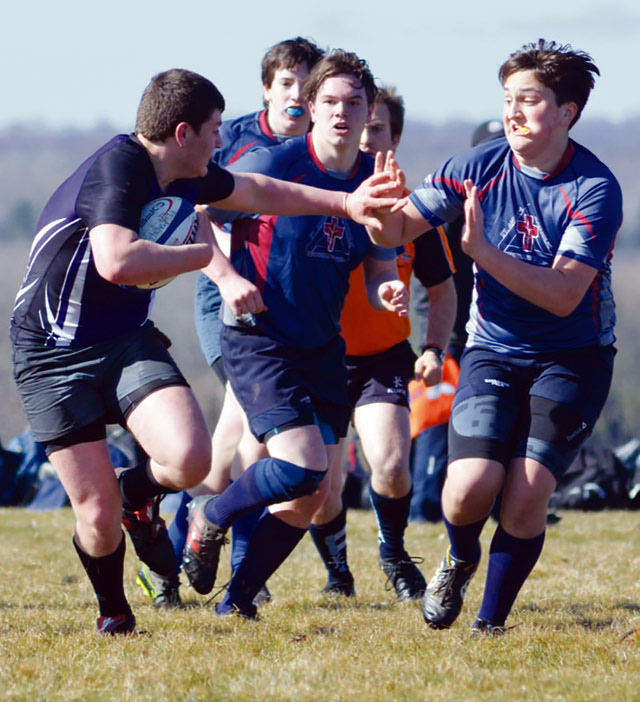 Madill Secondary School Junior Rugby team recently returned from the Barbarian Cup, marking the end of the team’s year. The cup, which was held in Belleville this year, was an exciting event to be a part of according to coach Lee Ann McDonald. The team left on Saturday, June 9, playing three games in the round-robin. Unfortunately, the team was eliminated before getting to the semi-finals. While the squad didn’t earn any wins, they did earn the respect of their opponents, according to McDonald. Normally, the teams are divided into four groupings based on school size, however, with no divisions at the cup, Madill could and did face off against much bigger schools. Their first match of the tournament, for example, was against Northern Secondary School from the Toronto District School Board which has an enrollment of approximately 1,800 versus Madill’s 610. Northern posted a 17-0 win over Madill. McDonald said, as a result of facing off against the team, they are setting up exhibition games against Northern for Madill’s Senior and Junior rugby teams next year. “I would say, as a coach, our players played their best game of the season against Northern,” she said. Aside from the championship, the Barbarian Cup also recognizes the players on the field through character awards. One player from each team is recognized and Madill’s Alex Coultes from the Belgrave area was given the award. The Barbarian Cup is the ultimate championship for school rugby squads in Ontario, McDonald said. To earn its berth at the tournament, Madill’s squad had to win the Huron-Perth Championship. Earlier this year, the squad took part in the Huron-Perth year-end tournament at St. Anne’s Catholic Secondary School. The tournament moves around every year and has four local teams face off against each other: Madill, St. Anne’s, Stratford Northwestern Secondary School and St. Michael Catholic Secondary School, also in Stratford. To win the championship, Madill beat St. Michael in the final 26-5 after beating Northwestern 24-5 in the semi-final.